1. Preheat the oven to 350° F. Coat the cups in a 12-cavity muffin tin with cooking spray. 2. Sift the flour, baking soda, baking powder, cinnamon, ginger, and salt into large mixing bowl. In a measuring cup, combine the buttermilk, vanilla, orange zest, and juice. 3. 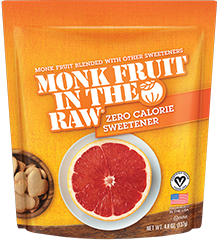 In a medium bowl, whisk together the oil, sugar, and Monk Fruit In The Raw® Bakers Bag until they are well combined. Mix in the wet ingredients. Pour the wet ingredients into the dry, stirring with a flexible spatula just to combine; do not over mix. Fold in the carrots, pineapple, coconut, and walnuts. Spoon the batter into the prepared pan, filling the cavities three-quarters full. 4. Bake for 22 minutes, or until the cupcakes are golden brown and a toothpick inserted into middle comes out clean. Cool the cupcakes on a wire rack. If not frosting the cupcakes or serving them immediately, wrap them in foil and store at room temperature for up to 2 days. 5. 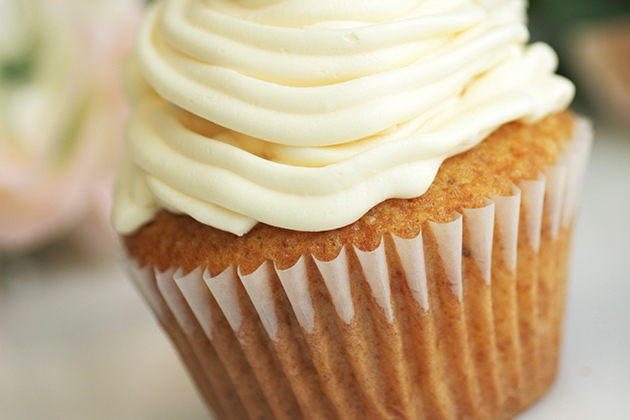 If desired, top the cooled cupcakes with Cream Cheese Frosting. Refrigerate for 1-2 hours to set the frosting. Let the frosted cupcakes sit at room temperature for 20 minutes before serving.